Shawls have become my knitting of choice. I'm not sure why they appeal to me so much, other than all the lovely lace. I like knitting lace. I like knitting sweaters and socks, too, but there's just something about lace. I knit the shawl using Dream in Color Wisp, a lace-weight yarn, in the Valentine colorway. I used 910 yards, although the pattern calls for 640 yards. Gauge generally isn't a big factor in shawls---unless you're likely to run out of yarn. Or if you're test knitting the pattern. The shawl was a fun knit, and fairly fast. I started this shawl on 22 May and finished on 01 June. 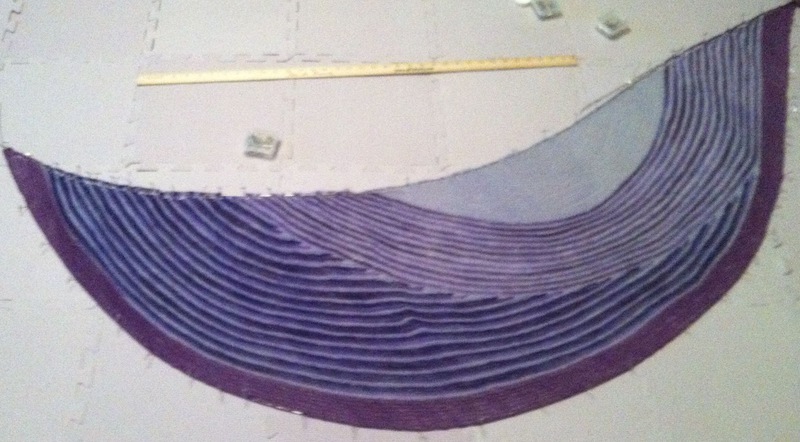 The final dimensions of my shawl were 77 1/2 inches by 30 1/4 inches. The next shawl I knit was also a test knit for Michelle Miller, the Be Sweet Shawl. I especially like the deep, ornate edging on this shawl. I knit this shawl using Knit Picks Shadow Tonal, a lace-weight yarn, in the Deep Waters colorway. 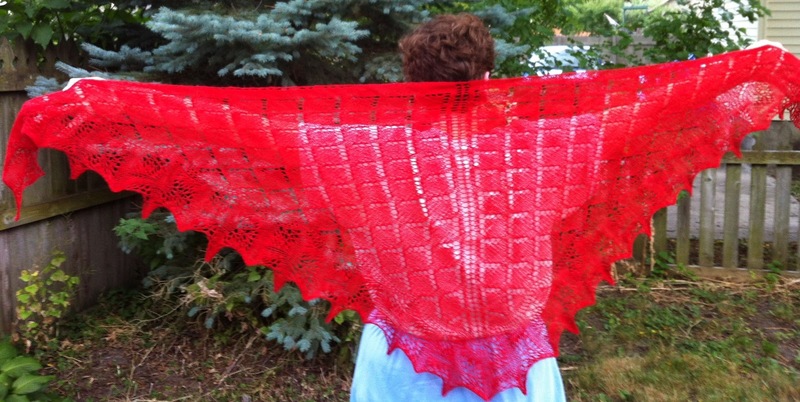 I used 475 yards of yarn, and the resulting shawl is 58 inches by 30 inches. I started the shawl on 01 June and finished on 09 June. The next shawl I finished was Color Affection by Veera Välimäki. This was my project for The Loopy Ewe's Camp Loopy, the first (of three) project for this summer's "camp." For this project, a knitter could choose any pattern by a designer who was born in a country other than the country in which the knitter was born. Being an engineer, symmetry appeals to me, but despite its asymmetric design, something about this shawl just called to me. Plus, it's all garter stitch, so I could knit without watching what I was doing, and since it's baseball season, most evenings my eyes are glued to baseball. The Color Affection pattern calls for three different colors of yarn, but I used four: The Loopy Ewe Solid Series in oyster, Fiesta Baby Boom in the Pansies colorway (the variegated purple that begins in the second section), Monkeypal Superwash Sock yarn in Deep Purple (the dark blue color in the bottom section), and Lorna's Lace Shepherd's Sock in Grapevine (for the bottom border). The latter two yarns were left over from other projects; the first two were purchased a year or two ago for...something. The bottom border was supposed to be 2 inches wide, but due to the limited amount of yarn I had, my border is only 1 1/4 inches. 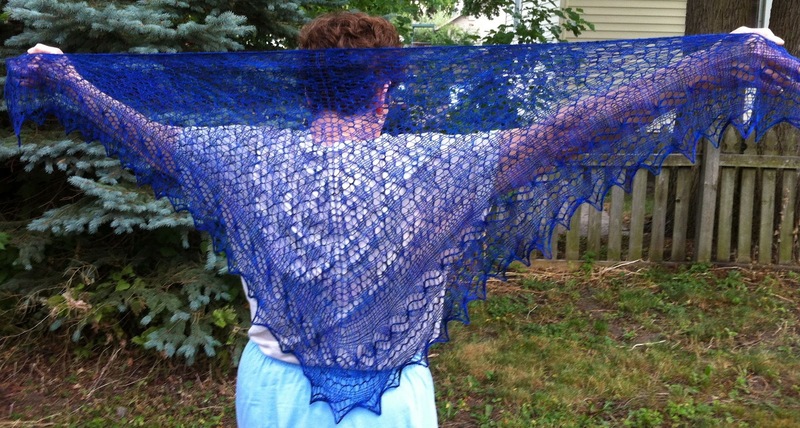 I used a total of 624 yards of yarn, and my shawl is 59 inches by 17 inches. The final size was limited by a slightly too tight bind-off. I started binding off using Jeny's Surprisingly Sretchy bind-off, but it seemed too loose, so I did a standard bind-off using a big (US11) needle. But the bind-off needs to be very stretchy to create the curved shape of the shawl, and my bind-off was not as stretchy as it should have been. If I knit this shawl again---and I probably will---I'll use Jeny's Surprisingly Stretchy Bind-off. The photo at the right shows my shawl staked out on the blocking board. It doesn't have quite the desired shape, but I like it. I started this shawl on 20 May and finished on 15 June. That nearly caused a problem because the dates of this year's Camp Loopy are not the same as last year, and I jumped the gun. I emailed the lovely ladies at the Loopy Ewe, and explained my dilemma. Since I'd started and finished a week early, my shawl was deemed acceptable for my first project. As the dates show, while I was knitting Color Affection, I was also knitting the two previous shawl and test knitting the pattern for a summer top. I finished one other shawl in June, but I'll talk about it next time. 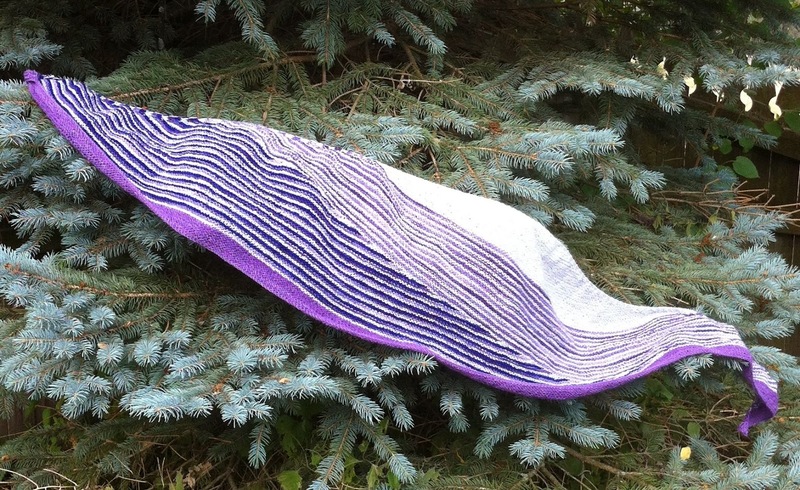 It was my first mystery knit-along, and I'm doing two others this summer. What have you been knitting? Professor of Mechanical Engineering, novelist and knitter when time permits.